Every day the East Anglian Air Ambulance saves lives across the region. Being a charity it relies on the support of the public. One way of bringing in donations is through a weekly lottery and it was decided to try and increase participation with a TV campaign on Sky Adsmart. 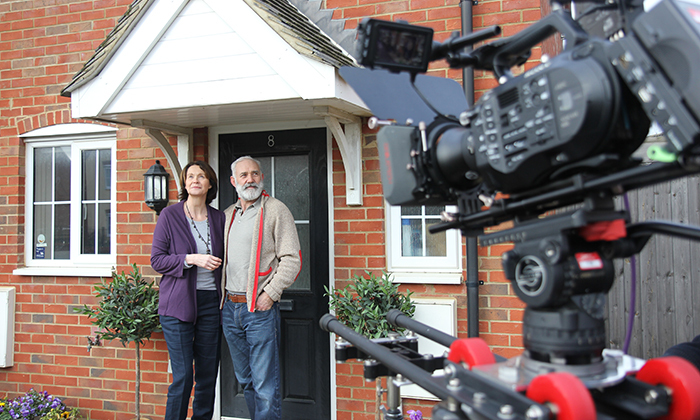 As the region’s foremost producer of TV commercials JMS was invited to work on the campaign. The advert concept involved an ordinary couple going about their daily lives. Even though they may not work for the emergency services, in their own way they are lifesavers – just by playing the EAAA lottery. Our shoots always throw up some unexpected challenges. On this occasion we needed to film the air ambulance taking off. However, the EAAA can’t be seen to be wasting fuel so were unable to stage the shot for us. Our crew had to wait for a genuine emergency callout before springing in to action! On the day of our pre-production recce our chosen residential street location was bathed in warm sunshine. But inevitably come the day of the shoot the street was covered in snow! Did we panic? No! We just enlisted our Production Manager Anna Eastick to clear the bushes with a broom! As for our actors and extras – we had to wrap them in coats between takes to stop them from freezing! But then, making TV commercials on location is always a bit of a lottery!